Album Comics was celebrating its twentieth birthday on Boulevard Saint-Germain and to do it in grand fashion we invited Jim Lee at a gathering to meet his fans. It was a great event and two wonderful days with the legend. I have to admit I was a bit anxious, stressed out to meet him and ask him the bunch of questions I had in mind. Nevertheless I did it and it was very illuminating. 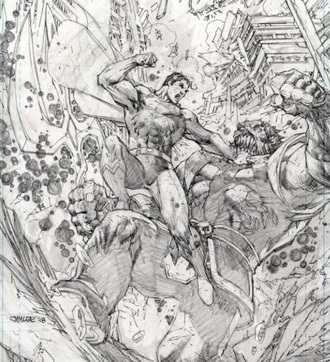 Due to technicalities Jim Lee was late on Friday night thus postponing the interview to the following day. Around 11.30 am I went to the 8 rue Dante in order to prepare the several copies of Action #1000 that Jim was to signed. Downstairs, where Album comics was born two decades ago, I was waiting. He finally arrived with Julien, and along a very long table where all the books were waiting to be signed I begun asking him questions. While he was signing them like a pro we talked. It was a bit like being Chaplin in Modern Times (1936): assembly-line work in the comics’ world. Julien was removing books and putting new one on the table, Jim, pen in hand, was signing copies as fast as Flash and I was at his side, my recorder on, pestering him about his carrier, his characters and so much more. Overall a fun experience that I am now sharing with you, Jim lee’s aficionados. Put your seatbelt on, watch out for Daemonites and be prepared for a trip with Batman, The X-men and the pantheon of superheroes drawn and liked by mister Jim Lee. 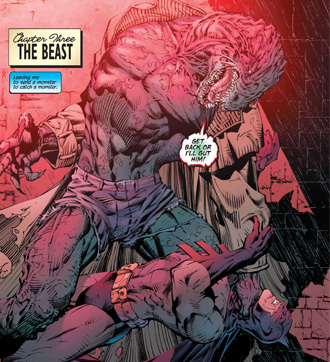 I decided to skip all the basic questions: when did you start, how did you start and so forth… Jim Lee being Jim Lee, the story must have been told a hundred time and to spare him answering them again I skipped them. Don’t worry dear reader I’m positive you can find them somewhere on the web. First thing first: Legends and independence. You tackled legends, Batman, the X-men and so forth throughout your carrier. Was it intimidating at first? Yeah! It was intimidated because I was such a big fan of the X-men growing up. Superman and Batman are the most iconic in the business so you can’t help and think about all the creators that worked on the characters before you. On one hand you want to honor the past and be respectful but in the same time you want to be a little fearless and put your own imprint on the characters. 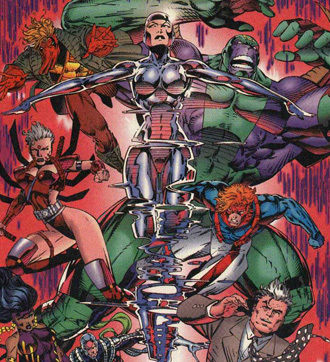 You took part in the creation of Image comics, you had your own Wildstorm. Was it important to have your own space to work, to be your own man? A Part of Image Comics was that we can own our creations. As I envisioned a larger universe, all the character would exist in it thus necessitating a studio where I could work with more creators to expand upon that vision. But in the same time, it also allowed me the opportunity of hiring a lot of young new artists and training them. That was really gratifying. A great experience! Could you tell us about your working process on characters? I do a general layout with everything, all the figure works to do composition, then I do the figures on the all page, and finally I do the backgrounds. Sometimes, depending on how I fill, I just draw the first panel, the second panel and so forth. There is no set way of doing it, but what I like about doing the figures first and then the backgrounds is that if I start running out of time or energy, I still put the most amount of time doing the figures. I think it is the most important work. 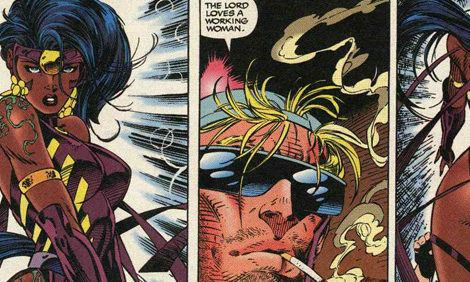 You created a lot of misfits or rebels like Voodoo, Grifter, the Emp, all the Wildcats actually… What does appeal to you in this kind of characters? One of the first thing someone noticing when looking at your drawings is the muscular and strong bodies of your characters what do they represent for you? I think the stories feature characters that are idealize version of humans, both male and female. Yeah, that’s one of the thing as well, you show as much men and women. Do you try to have kind of an equality between sexes? Yeah I know, it was rude of me to cut Jim short, but you know I was like a little kid in front of a hero. Be kind enough to pardon a fool. I think so. Now though, I try to draw other type of body too. I think the traditional way of telling superheroes stories is to idealize both men and women but the market place changes, the mentalities change. They want more representation, more diversity. Look at a book like Immortal Men that came out, one of the character, Timber, is a larger, bigger boned female character. There is more diversity than ever today. Have you done a lot of research on human anatomy? I think when you first break into comics you are really focus on drawing everything correctly and once you know how to… kind of do it, then you can maybe focus on exaggerating the forms and doing something different. The first stage is to draw correctly and the second is learning what you can exaggerate and personalize to make it more your creation. Hand vs Digital Working. What does digitally working brings to the table, to your working process? I don’t do much digitally actually, I draw everything on paper. I may only do corrections digitally, after it’s inked or colored, when maybe something looks different or wrong: maybe a head will look too small, an eye was inked differently that intended… So I’ll go and digitally do a correction or change. Sometimes I do sketches of costume and I color it digitally because it’s faster than doing it by hand and I can do many variations very quickly. I still prefer drawing with pencil on paper and Scott Williams, the inker, still inks directly over the pencils on the original board so we only have one original. I’m old school that way. Your drawings have a lot of details, in characters as well as backgrounds. Do you want to make the environment, the stories real, tangible? One of my favorite artist growing up was Neal Adams. What I loved about his work is how real everything felt, almost like a photograph. When I draw a scene I want to have all the backgrounds, all the details so it feels like it’s actually happening: you can stand in the panel and believe you can turn around and see more details. I want it to be immersive. It feels like a 360 degree experience although I’m only showing you 180 degree. You also have a lot of movement, everything is dynamic. The two things I focus on the most are realism in details and dynamic motions. The thing about superheroes is that it’s pretty much built on the work of Jack Kirby, and he was all about power. A lot of people either focus on power or they focus on realism. To me, I like the idea of combining the two. What about layouts and sketching? I do layouts and I draw right on the layouts on the board. I don’t do separate sketching. Some artist do small one, I just do the layout on the original board and draw right on the board. What part does the frame have in your drawing? I don’t rely on that too much. I want what’s inside the panel to be experienced first. So It’s rare that I play around with the panel layouts. I do it sometimes … I don’t do it consistently, but there might be a sequence where it calls for something more symmetrical or lots of little panels. But I’ve never done something like The Dark Knight Returns where Frank had a specific use of small panels and large panels. I think that is easier to do when you write your own stories. I try to be pretty faithful to the number of panel the writers ask for and I try not to mess with it too much. Let’s talk about Action Comics #1000 now. What does it feel like to be part of that adventure? You know I never really thought about it until we realized in house, maybe a year and a half ago, that we were going to come upon this milestone. Because we had renumbered the title a couple of time, you kind of loose track. It’s not until we brought back the legacy numbering that we realized we were going to reach this number. It’s nice to be here for this historic issue and contribute again to the mythology. It’s a pretty historic moment and it’s nice to be part of it, to celebrate this 80th anniversary. Preparations must have been a brainteaser? Just like any other issue I think. The challenge was: what can we do so it doesn’t feel like just a celebration book. Can we create a story that kind of open up a new chapter for the character? I think Brian Michael Bendis was able to deliver on that, so it was good. We didn’t want to make it feels like an issue that didn’t matter. The first issue of something that will start a new direction for the character and that’s what Brian was able to accomplish. I’m very excited and honored to have illustrated that story which kicks off a new chapter in Superman’s life. Could you tell us something about Rogal Zaar, the new villain? He is the villain that I co-created with Brian Michael Bendis and it is a character which unlocks something that even Superman has not known about his past. It’s a great way of challenging a mythology, telling fans that read Superman before that maybe they don’t know everything about the character and it starts this sort of mysterious story which illuminates untold stories of Superman’s past. What are your favorite and worst character to draw? I would say my favorite character to draw is either Batman or Wolverine for different reasons. Batman because he has a lot of shadows and it makes for a very dramatic image. Wolverine because he is a very ferocious character so there is a lot of fun in creating a pose. No character is hard to draw, some are more time consuming, like Aquaman or Spider-man. They are characters with lots of little detail in the costume, wether there are scales on the armor or webbing. It’s time consuming to do it, it’s fine for a cover or a single image, but if you tell a story in every panel, you are doing it over and over again… At least for me, some people can do it more easily. What was the most memorable event in your carrier? I think, hopefully, that is to come. I’ve been fortunate to have done a lot of amazing projects and certainly Action #1000 ranks up there. But I’m also involved in Batman #50, which i’m very excited to be involved with Tom King and then obviously Detective #1000 is coming around the corner as well. There are other stories, other projects that I’m very exciting to be working on but they haven’t been announced yet, so… I think it’s always good to have cooler things in the future to kind of motivating you, inspiring you to move forward. My favorite Superman’s story is Superman vs Mohammed Ali, favorite Batman story is probably Dark Knight Returns. It is character dependent really. I loved 300, honestly everything by Frank Miller. I was done with my questions but Gauthier, who came to help us out with the comics had one more in stock: If you wouldn’t have drawn comics what would you have done? I guess I would have been a doctor. I don’t know. It’s hard to imagine that possibility because at the time I felt like this is it! I have to do it! You don’t think about the failures. I don’t know! Maybe I would have been a doctor. Books were signed, I was done, Jim was hungry so we parted way as we must do now dear reader. I hope you found the interview interesting or at least fun to read and I hope to see you again for further explorations of the vast universe of comics. Never cease to read, never surrender, keep on enjoying comics kids!